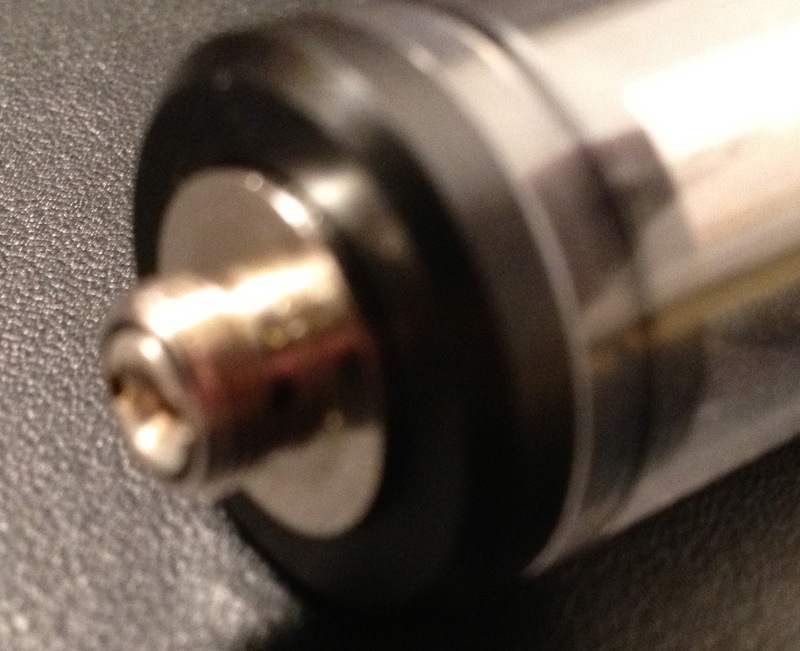 Dual coil cartomizers aren’t a new thing in the e-cigarette world any more. Neither are dual coil cartomizer tanks. As is the case with a number of things in the world of electronic cigarettes, once something gains popularity, the factories begin to take notice. Smoktech decided to take on the dual coil tank thing with their own low-priced version of the popular e-cig add-on. In this review, we’ll give Smoktech’s entry a rundown and see how it compares. There’s not a whole lot involved when it comes to dual coil cartomizer tanks. You take a polycarbonite tube, some endcaps and gaskets, put them together, punch a hole in a cartomizer and Bob’s your uncle, you have a carto tank. Smoktech didn’t do a whole lot more than what everyone else is doing when they came up with their tank. As I mentioned in the introduction, Smoktech’s take on the carto tank is very competitively priced. At this price point, don’t expect to see stainless steel or aluminum end caps. The end caps in this tank offering are black derlin. As far as looks go, the Smoktech dual coil tank is pretty pedestrian. 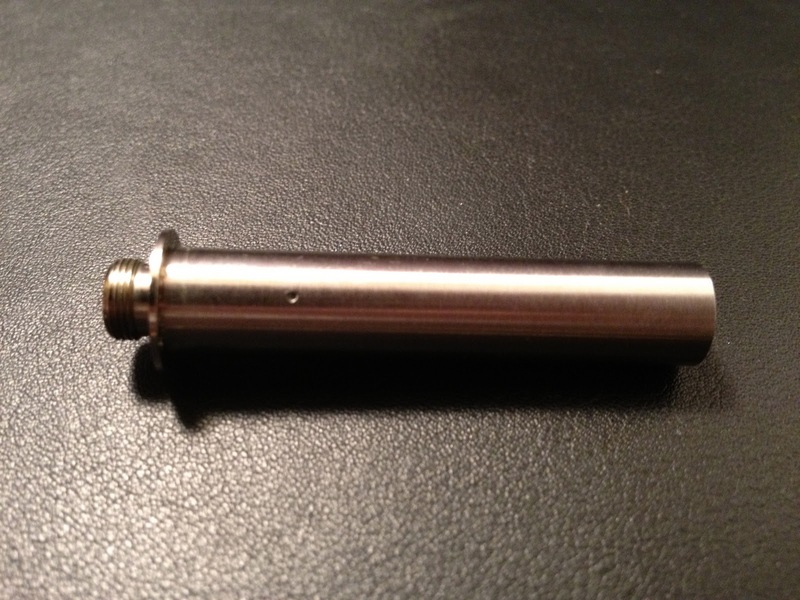 The tank also comes with an aluminum whistle-tip style drip tip. The bottom endcap does have an indentation for a special flange on the included Smoktech cartomizer. The flange does serve a purpose beyond ensuring you can only use this with cartomizers produced by Smoktech. The add-on bit and indent keeps the tank properly aligned and prevents the carto from slipping (at least in one direction). 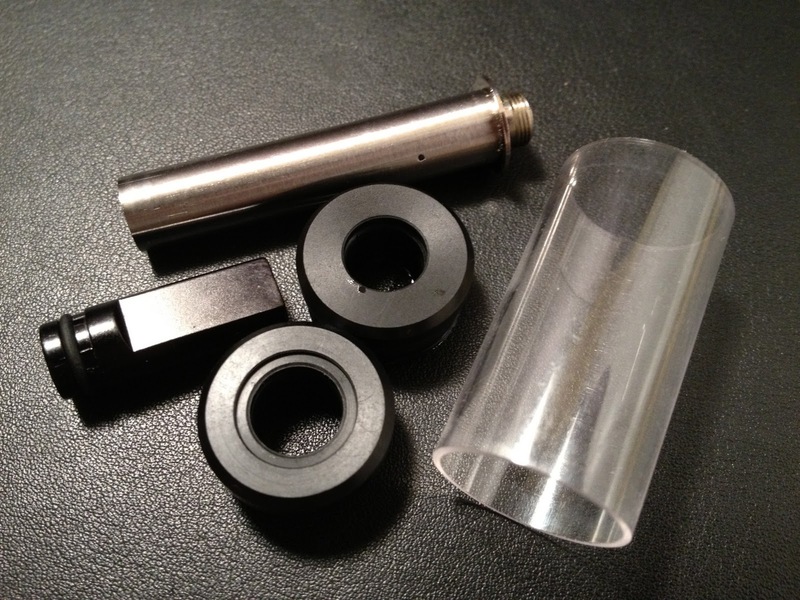 Naturally, the cartomizer also comes with a feeding hole punched in cartomizer at the factory. The interesting thing about the hole is that it’s absolutely tiny. The hole is about the size of a pin prick, and there is no indentation in the cartomizer. Despite the tiny size of the opening, it doesn’t seem to have a problem keeping the cartomizer filled. Unlike the Big Daddy tank, the Smoktech version has to be filled from the top due to the flange in the Smoktech version. Simply either remove the top cap and fill, or slide the cartomizer down until a syringe will fit between the opening of the top cap and the cartomizer. If filling the tank for the first time, also fill the cartomizer as you would a normal carto. The hole while somehow (magic?) being able to keep the cartomizer properly lubricated, isn’t quite large enough to initially saturate the carto. This step is only necessary the first time a new cartomizer is used. 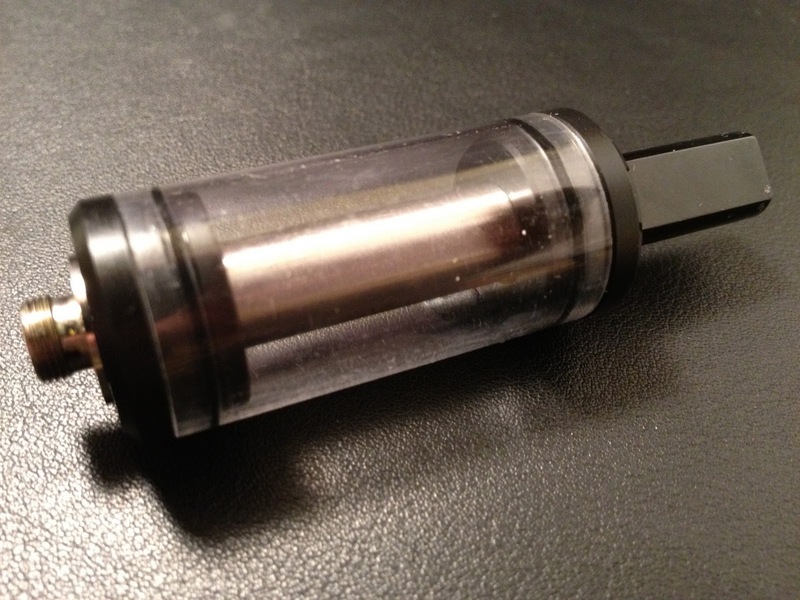 Once the tank is filled, it performs pretty much the same as a standard dual coil cartomizer. These types of cartomizers are fairly versatile. They produce acceptable levels of vapor at 3.7volts. When using 3.7v I tend to prefer Smoktech’s single coil 1.7Ω cartos, but the sepcial cartos for this tank only come in the dual coil variety. The Smoktech tank spends a lot of time on my Copper Hex because I can run that at 6 volts with two batteries. I much prefer dual coils at this higher voltage. When you really run the current through these cartomizers, they produce heaps of very warm and flavorful vapor. Running dual coils at higher voltages runs through the e-liquid pretty fast. I was concerned that the tiny hole in the cartomizer wouldn’t be able to keep up. Fortunately, I was wrong, there’s no problem keeping the cartomizer wet at this level. In fact, for some reason it seems to do a better job than the cartos I’ve punched myself which have much larger holes. I’ve also noticed the pre-fab cartomizers tend to last longer than the ones I do myself. I’m not sure if this is some sort of optimal design an engineer came up with, or pure luck. The Smoktech Dual Coil Tank is a low-priced 6ml cartomizer tank produced in a factory alongside the very popular line of Smoktech cartomizers. The cartomizers are pre-punched at the factory, but unfortunately feature a flange marrying the Smoktech tanks and cartomizers to each other. While the Smoktech tank isn’t as stylish as other tanks on the market, its low price and wide availability should make it a popular product. Disclosure: I feature affiliate links and banner ads for Vapor Alley and MadVapes. NEXT POST Next post: e-Cigarette News Update 12/9/11: The Jig is Up! For me, the wonderful thing about carto tanks is the capacity. I run a 5ml tank, so between that and an extended 18650 battery I can get through the entire day with just one piece of kit. No refill bottles, no extra batteries, no spare cartos and carry cases – it's awesome! Buy yourself a cheap Dremel and as long as you have a steady hand you don't even need to pay extra for pre-slotted cartos. I have tried cartomizers before and like the way they perform but they are awful to fill, leak and are messy. Maybe this one is worth looking into. except having to fill the cartomizer the first time, you just have to worry about filling the tank. Using a syringe makes it easier, but it's still a little less fussy than filling a cartomizer all the time. I also own this tank. I used the non flanged dual coils in it without any issues. Right you are! I just checked with one of mine. It doesn't feel quite as tight without the flange, but I just fit a SmokTech XL carto in there with no problem. Thanks for the tip!